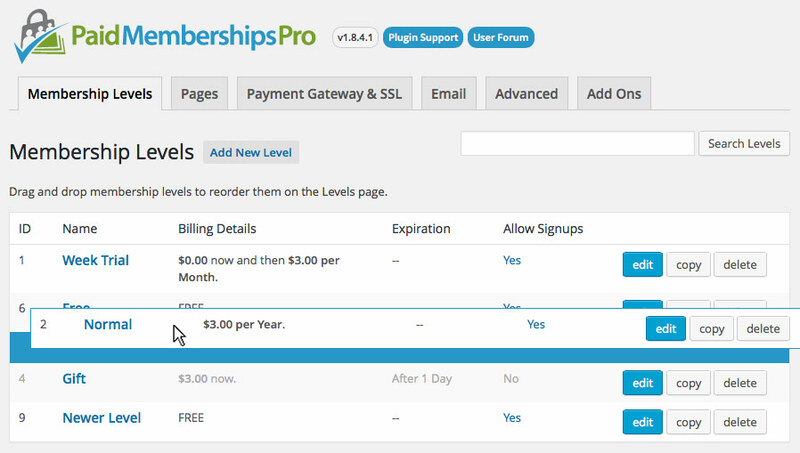 Navigate to the Memberships > Membership Levels page in the WordPress Admin. Here you can drag and drop the membership levels into the order you would like them to display when using the default [pmpro_levels] shortcode or the [pmpro_advanced_levels] shortcode. If you are using the [pmpro_advanced_levels] shortcode, you can also specify the levels="2,4,1" attribute to force the display in your preferred order. This method will simultaneously reorder the display AND filter out levels you do not want to display. Some sites would like to customize which levels are offered based on the current logged-in member’s active membership level. There are two methods to dynamically alter the display of the membership levels page: using the [membership] shortcode or using the pmpro_levels_array filter. In this example, members of level 1 will see details for levels 2, 3, or 4 while members of level 2 will see details for levels 5, 6, or 7. The last portion of the sample above will show the option to check out for either level 1 or 2 for any non-member (level=”0″). Note that if you truly need to restrict check out based on existing level requirements, check out this blog post with a deeper tutorial on membership requirements for checkout. The recipe below demonstrates how to filter the output of the [pmpro_levels] shortcode to show specific levels based on the current user’s level. You’ll need a working knowledge of PHP in order to customize this example for your specific needs. Support level members can open a ticket in our support area for help with this function. Here’s a tutorial for hiding all the free levels from display. This is a useful method if you have free levels that are reserved for specific customers or promotions, etc. To hide levels using the [pmpro_advanced_levels] shortcode, just exclude them from thelevels="1,2,3" attribute of the shortcode. Easy! Option 1: Define hidden levels in a custom function. The code recipe below allows you to define specific level IDs that will not be shown on your membership levels page. Option 2: Add a setting to “hide” levels from display on the Memberships > Edit Level admin. This code recipe adds a new level setting to hide the display. If you expect to be manipulating level display fairly often and would prefer to do so via settings in the dashboard vs. code, this is the recipe for you. After installing the customization code, just navigate to Memberships > Edit Level and set “Show level” to “Yes” or “No”. If you have only one public level of membership, this method will redirect members from the membership levels page directly to membership checkout for the defined PMPRO_DEFAULT_LEVEL. As with the “skipping” option above, this method will allow you to use the default WordPress registration process (or another plugin or theme’s registration process) and apply a default level of membership. ← How to stop members from renewing their membership level.